Trade shows can often be disappointing things. You turn up full of expectation and excitement, but leave disillusioned and disappointed: most of the exhibition space turns out to be populated by third-party accessory makers and unmemorable me-too products, and the few high points are usually concepts that the manufacturers don't have the slightest intention of building. CES 2014 looks a bit like that. There are concepts in the form of AMD's amazing gaming tablet and this year's batch of "my TV's got more inches than your TV" size queens. There are endless accessories for your consumer electronics kit and far too many tablets. And there are things nobody sensible will ever buy such as Bluetooth toothbrushes and Google Glass-equipped treadmills. It's not all stuff and nonsense, though. 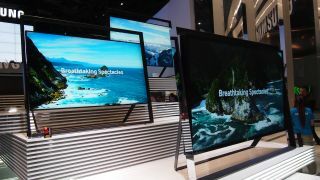 Big, bendy TVs and Bluetooth cleaning products may have hogged the headlines so far, but there's some really interesting stuff happening in Vegas right now. "Computing's moving from being with you to being on you." You know tech has taken over when some of the most interesting exhibitors at CES are car firms. BMW and Audi are both there with impossibly futuristic cars (presumably the self-driving Audi has an "automatically tailgate at dangerous speeds" mode to make it just like an Audi with a human at the wheel), while Toyota might just have showed us the future with its plans for hydrogen-powered cars in 2015. Less excitingly but much more immediately useful and affordable, Sony showed off a double-DIN cradle that enables iOS and Android devices to become in-car entertainment systems. While we're talking Sony, there's also Core - a tiny chip that records your entire life and hands it over to the NSA... Er, we mean that records your own life and enables you to "watch your lifestyle played back to you on screen". That's probably less fun if your lifestyle, like mine, largely involves being slumped in front of a screen, but still. And then there's Intel, which reckons wearable computing - with Intel inside, naturally - is the future. It showed us a kind of supercharged Siri, earbuds that track your fitness and a smartwatch, and it also demonstrated Edison, its take on the Raspberry Pi. The idea is for Edison to power the next wave of wearable tech, like baby monitors, and Intel's putting its money where its mouth is: it's offered a $1.3m prize in a new wearable tech development competition. That takes care of the immediate future, but Intel's thinking about the longer term too: according to Mooly Eden, we'll see implantable devices hit the mainstream within our lifetimes. Computing's moving from being with you to being on you, and if Intel's right then the next step is for computing that's actually in you. That's much more interesting than a slightly bigger TV.